Trauma histories, especially trauma in young children is a really trick beast. It sneaks up on you when you least expect it. Except, when you step back, you realize you should have expected it all along. It’s trauma anniversary time. Even years later, sometimes almost a lifetime later, many people who have experienced severe trauma and PTSD causing events will often tell you that they instinctively know when the anniversary date of their trauma is coming up. With children, even children who are far too young to understand a calendar, you can see this phenomenon in full effect. Their minds may not have conscious memories of their trauma histories, but their bodies remember. And remember vividly. What astonishes me is that our tricky, and extremely smart internal clocks, know the anniversary is drawing near even when there is nothing in the environment that is similar to the environment where the traumas occurred. This is very evident in children who have been adopted internationally and had their traumatic events happen in a different country, with different smells, weather, food, and languages. Yet every year, on the anniversary of their traumas, their bodies remember. The reaction to these anniversaries vary, and as the child develops their reactions will change. Younger children may struggle with excitabilities, dysregulation, food issues, sensory issues, nightmares, and more. As they grow their reactions usually start to become more cerebral and introspective. Big emotions and deep discussions may happen. Aggression and frustration can rage through their bodies. Nightmares and insomnia can become an issue. Anxiety and stress can fill their days. Even children who suffered prolonged trauma exposure, often have certain anniversaries that are more pronounced. 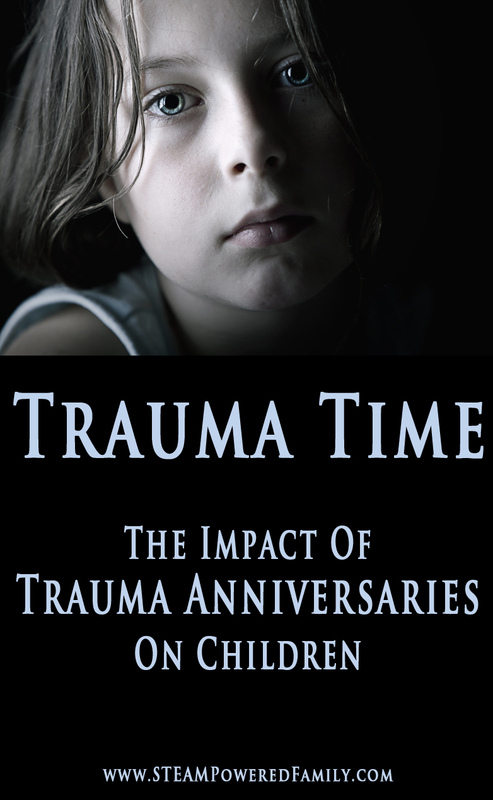 It could be the anniversary of a particularly intense period of trauma or it could be tied to something that compounds the trauma, like a holiday (Christmas issues anyone?). We are currently in the midst of an intense trauma anniversary. It’s hard. Things were going so well, then suddenly we noticed our son changing. Dysregulation took hold. It was as if one day our son suddenly lost years of development. Where he was excelling in math one day, almost a full grade level ahead, the next day he could not answer the most basic of preschool problems. Yet at night the big thoughts came out. Deep discussions and evidence of his understanding of hard issues I wish no young child ever had to understand, let alone my son. Trauma is hard. Parenting a child with trauma history is hard. If you are parenting a child with a trauma history here are a few tips to help you through these trauma anniversaries. 1 – Journal and be aware of the patterns. Especially if you are parenting a child who was not born to you and you may not have all the information from their past and traumas. Knowing the root of the issues really helps in deciding how to address things. 2 – Parent to where the child is at in that moment. You can not spoil these children by providing what their brains need. If the brain is stuck in an infant state, then parent as if the child was an infant. Cuddle, help with feeding, dressing whatever they need help with, provide it. They will not be able to function fully while their brains are stuck in the trauma. Read their clues and empower them to feel no shame in asking for help, whatever form that help takes. 3 – Don’t get frustrated. This one is hard. So hard. I struggle with it myself. It’s hard to understand how your child can change so significantly over such a short period of time. 4 – Get help. A child who has experienced severe trauma is at a much higher risk of developing mental health issues as a teenager and adult. The window is so fleeting and short to develop the right habits now before they become teenagers. Find good quality therapists and encourage your child find professionals they trust and help foster that connection. 5 – Use these times to focus on health not academics. Encourage your child to eat healthy, drink lots of water and get plenty of physical activity while dealing with trauma anniversaries. This will help put them in a stronger place to deal with these issues on their own down the road. When they feel the big emotions, the physical pains, the internal struggles, instead of going for drugs, alcohol, food or other negative inputs, they will instead know to take care of their physical self to help strengthen their mental health. This is so important for lifelong health and management. 6 – Ensure those that need to know are aware of the situation and how to deal with it. This includes teachers, childcare workers, program instructors, close family, etc. You don’t need to share your child’s personal and private details, but ensure they are aware that your child is struggling and how they should address any issues they might encounter. 7 – Know that this is in response to a trauma anniversary. It can have big impacts but it should pass. It may last a few days, weeks or a month, but it should pass. If it doesn’t, get help. 8 – Take care of yourself. This is extremely hard in these situations, but make sure you are eating healthy, drinking lots of water, taking moments where you can, and lean on your village. Friends, family, whoever is in your trusted circle, get help. Modeling the good behaviors of self care, promoting physical health, and asking for help, will be seen by your child and will help them develop good coping mechanisms themselves. Trauma anniversaries can be very difficult to navigate with children because their is so much unknown. Children often don’t have the vocabulary or awareness to be able to communicate what they are experiencing and feeling. It’s up to the parents and other trusted adults to act as detectives and help the child understand their bodies and minds. Parenting a child with a history of trauma, but also being in any capacity as a trusted adult to a child who struggles, is a big burden. Our society tells us children should act and behave certain ways and if they don’t they must be disciplined, but for a child whose brain development has been affected by trauma their behaviours are not about you or the child. They are about the trauma and the devastating things that have happened to that child. Stepping back and seeing the behaviours for what they are can help adults keep perspective even when the child’s behaviours can seem illogical on the surface. One last parting thought, there are a lot of horrible things that happen in our world. Be very aware of the impact these events, or even hearing about these events, can have on children. Sometimes it may be best to leave the radio or TV turned off or skip over certain academic studies while the child is struggling, and save the big issues for a time when the child is better able to cope and understand. This is especially true in a school environment where the child may not have appropriate supports or feel safe discussing certain issues. Use caution and be very aware of the impact certain topics may have on a child. Previous Post: « Fill Up That New Kindle – Kindle books 9 to 12 year olds love! My daughter sinks into a deep depression on the anniversary of her father’s suicide (which is also the day before her birthday). It’s so painful. Time doesn’t seem to heal that wound. Great informational article! Thank you for this! We have a traumaversary coming up soon, which is why I went looking for information about it, and stumbled upon your post. It is crazy how the body remembers. Our son is 4.